Specialbutik for løbere på ALLE niveauer. Size guide INSTANT GO WITH EVERY STEP. 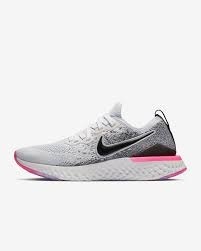 The Nike Epic React Flyknit 2 takes a step up from its predecessor with smooth, lightweight performance and a bold look. An updated Flyknit upper conforms to your foot with a minimal, supportive design. 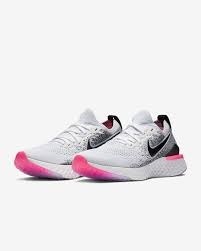 Underfoot, durable Nike React technology defies the odds by being both soft and responsive, for comfort that lasts as long as you can run. 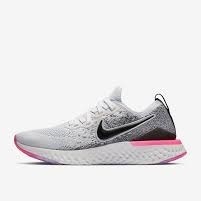 Nike React foam has a lightweight, durable design that is also ultra-soft and incredibly springy. 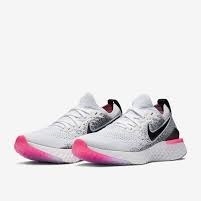 With every step, the foam responds to your foot by snapping back. The more energy you put into your step, the more you get in return. A lightweight Flyknit upper gives you plenty of stretch and airflow while you run. It conforms to your foot for support with every step. The all-new molding at the heel was informed by runner feedback. It helps keep your foot stable, for an even more secure feel during your workout. Inspired by the 90s tech world, the design features brighter colors that pay homage to the hand-held gaming devices and desktop computers of that era. Inner sleeve provides easy entry. Contoured collar sits right below your ankle for a comfortable fit. Outsole pattern has rubber on the forefoot and heel for durable traction just where you need it.